Heritage Happens Turns Two Today! Happy Second Blogiversary to Heritage Happens! I never expected when I began this blog that I would still be here two years later. Who was it that said "Never say never?" I thought about not doing a post, but that was for a split second, that thought didn't last long. Who could really NOT do a post on their blogiversary if they actually knew they were having one? Not I…. While blogging has been mostly none existent in the last couple weeks, I do plan to get on track just as soon as possible. 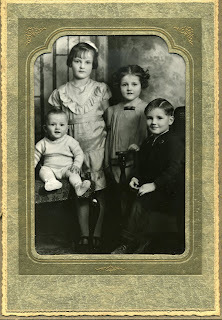 I miss this wonderfully, fun hobby of blogging and genealogy. I miss the camaraderie, learning and creativity it brings. I have been side tracked by family and friends health issues; deaths, illnesses (pneumonia), broken bones, cancer, surgeries, hospitals. From robbery to a missing person, and people with guns, the negatives have been haunting me and they don't seem to be stopping. I am trying to remember "this is life" and I can't "fix" everything, but it is difficult, I tend to hurt for everyone. Where have I been? Why haven't I been posting lately? Let me fill you in. A cousin, who has been helping me identify photos that I have been scanning, has been on vacation. Without realizing it, I gave myself a vacation from genealogy. I suppose I felt it was the perfect time to work on some other things, non genealogy related. Summer, projects and a few other things have kept me busy. I recovered my daughter's dining room chairs. It was a fun project, something I had never attempted before. I completed a baby afghan I made for the shower I attended last Saturday. There have been many, many hours spent working in my front yard. After removing a large juniper, my work really began. There was an awful lot of lava rock that needed moving out, and river rock which needed to be moved in. Of course shopping for and planting plants. I actually see light at the end of the tunnel regarding the yard! I have to admit I am already much happier with it. I was saddened to hear that Terry Thornton passed away last night. I heard probably a bit to late that he was terminally ill. I sent him an email this past week, however I doubt he ever read it. I thanked him for approaching me and making me feel so special once upon a time. That was when I first "met" Terry, almost two years ago. Terry, you will never be forgotten. I appreciate what you did for me and for being a friend. I hope you know this. May you rest in peace. Moving From Backwards To Forward, Isn't That Moving Backwards? My uncle was born on March 19, 1924 in Spokane, Washington as Richard Harold DeMoss. (I have never known him as DeMoss) I had been contemplating posting copies of his service records and such when it came to my attention that I haven't scanned any of his documentation! I had "moved forward" as I have his mother and her line in my system, etc., but I do not have anything in my genealogy program other than a name and basic dates for my uncle. I found it interesting that when I went looking for information in my files under Harding (which is what I grew up knowing his last name to be) and then under DeMoss also, I couldn't find copies of any of his files on my computer. 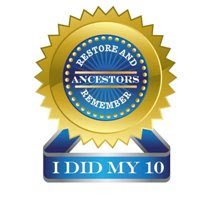 Seems I have been more focused on "older" ancestors and organizing their paperwork. Time to move from backwards to forward a bit...darn, doesn't that mean I am going in the wrong direction??? I know you haven't heard from me in a few days, but I have good reason! First and foremost, I have been taking care of my grand children this week, the prince and princess, some of you may already know this is what I call them. The prince is 3 yrs, and the princess is 15 months. They have kept me on my toes, but oh what a pleasure! So, life goes on, with many interruptions sometimes, and things get put on hold. The next item I am about to discuss is what I have been spending my tiny bit of free time doing lately, instead of blogging and researching etc. Have you read or heard about Footnote.com and LowCountry Africana teaming up for an indexing project? I know I have seen it posted in the Family Tree Magazine's Genealogy Insider Blog and on Twitter. I haven't had much time to poke around lately, but I have seen a badge earned and posted to at least one blog site already.